Orizome is playing of Japanese children. Fold thin wa-shi (means Japanese paper). Dip it to colored water. Open it, and you will find unimaginable pattern and color. We make it as iOS App. It may not be red-hot App, but we think that you can enjoy it over 100 years (even if it is once per a year though). We are happy if you can get pleasure from this App. 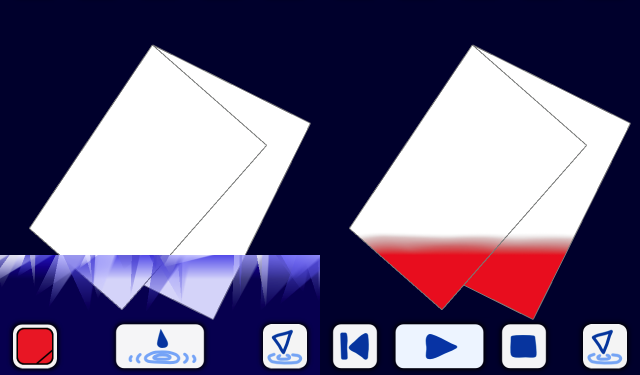 With button in the lower right, you can change fold-mode and dye-mode. Firstly, let’s fold paper. Draw line(green&white) with drag, and fold paper with button. In addition, tapping corner of the paper, you can draw line with dragging the corner. In dye mode, dip your paper to the colored water (lower blue area), and dye with . You can change color with . After dyeing, expand soak. NOTE: “soak” may be wrong word. I say “soak” as the expansion of dyed color. Expand? Yes, this is the point that deffer from real orizome. In real world, dipping paper soon expand soak. But in this App, you can (have to) control soak expansion manually. For example, expend soak with button, and pause expansion with button. This is how to move, scale or rotate. Basic explanation about this App is over. Let’s fold and dye paper, and create colorful images with your idea and sense. In Setting page, you can change soak setting. You can set such as custom-colored, item bobbing up and vivid colored edge bands. We think that this setting is special feature of this App. Of course, you can’t experience it in real world. Enjoy various setting. 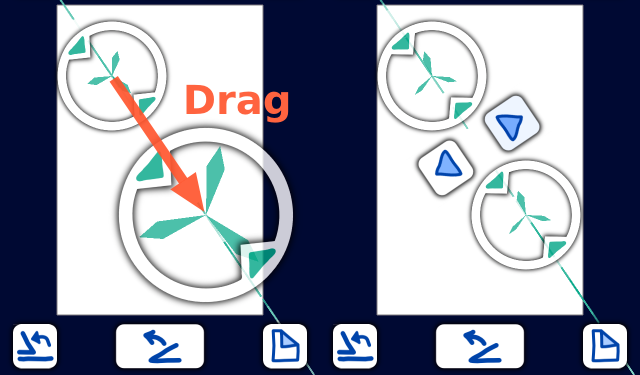 You can save the image created in the preview page. And you can tweet in it. We are looking forward to your piece of work. In addition, you can freely use images created in this App. When you use images, You need not report to us, need not show notice of copyright of us. If you (fortunately) want to introduce this app, it may be good to write down URL link to http://ginuuk.net/orizome-en/ . And, we provide Add-on which make advertisement-banner invisible and enable High-Quality-Setting and etc. Please check it in App for more information. Thanks for your read, and enjoy it! If you have a question or find bug, please feel free to ask us with inquiry form below. Of course, such as your impressions about this App and message to us are welcome.